After looking at various canvas/JS libraries and CSS keyframing, we thought it would be good to give Adobe Edge Animate a spin, as it was new, cross device/browser and surprisingly, free. For a v1 release, it is remarkably stable. 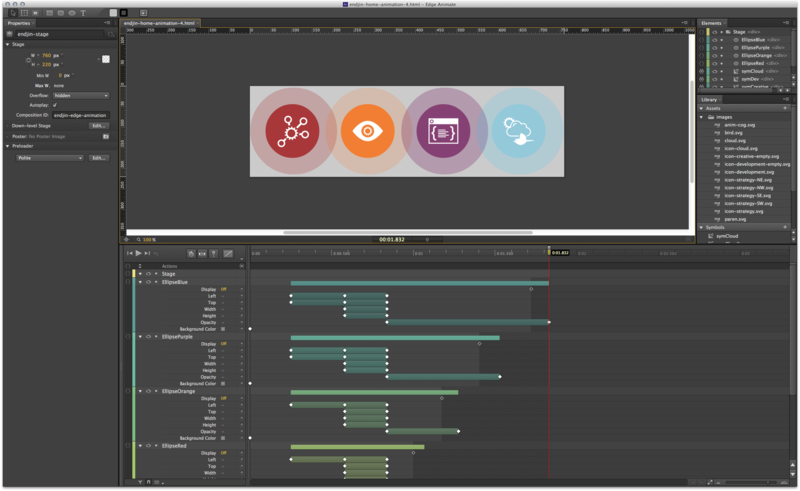 The UI fits in with the great Creative Suite 6 style and is easy to grok on first look. The code it outputs is a little heavy handed, but it’s great that you can go in and tweak it by hand after you’ve published for fine tuning – something you couldn’t do with a .swf. All in all, a very interesting product, it looks like Adobe have created their own Flash killer.